Position of specimen is both the experiment is different from each. In the Izod method, the test material was placed in a vertical position, while in the Charpy method, the test material was placed horizontally. Face of specimen which faces the striker is different. The notch face in the izod test is facing the striker, fastened in a pendulum, while in the charpy test, the notch face is positioned away from the striker. charpy and izod test does not give same results, they give formation about the same mechanical property ( Impact resistance) under different experimental conditions. Izod gives cantilever failure while charpy gives simply support failure. Why is it that in Charpy test the notch is facing away from the striking face while that is not so in case of Izod? What is the difference in both the kinds of notches? Why can Charpy use both U and V while Izod can use only V? answers are simple, they want to test the specimen in that pattern. these test are perform to check the mechanical properties of the specimen indifferent condition that why they use different notches and place the specimen at different angles. What is the advantage and disadvantage for both of them? i have a class test tomorrow. im confident that your points will help me tomorrow. Best of luck for the class test. Which test is preferred for better results?? could you tell me different between R2 and R8 stricker in Charpy Test? Is this influence to result? Who carried out charpy and izod test? How to select carry out charpy or izod? Both test are same striker used.others website don't show any information for striker. What should be the angle of striking hammer for both test? The only angles i know for these experiments are the angle of striker arm from mean position to the maximum amplitude position before striking and from mean position to maximum amplitude position after striking. 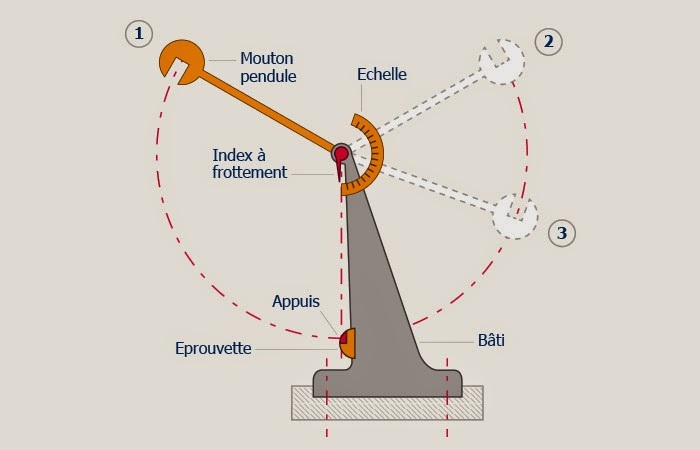 What is the length of pendulum and what should be the weight of striking hammer ?? Length of pendulum and weight of hammer does not matter because toughness obtained as energy(Potential energy)(unit Kj/m^2) is the result of initial and final energy (Potential energy) of hammer. assalamualaikum nk tnya klau soalan tnya explain principle each testing and different method nk jwb apaa eaaa??? ?